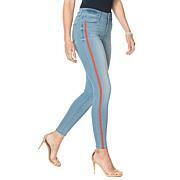 I am one who rarely writes reviews, but these jeans are incredible! I can tell you that everything Bethany states about them are on point. Ive just ordered another pair. I love the look of fitted jeans, but as Ive gotten older comfort is important. Well, not only are these jeans comfortable, they are extremely attractive and wear well. I am a super fan!!! I'm not surprised that if Bethany was going to do jeans...they would be spot on!Great job Bethany! Love Love the style and most of all the comfort of this jean. I am a size 27 but I sized down to 26, which is a perfect size for this stretch jean. the rips/distressed go back to shape and do not continue to rip. I plan to buy a few more pairs. These jeans are so cute and fit like they were made for me. Im a size 16 and ordered that size and the fit is spot on. The distressing is perfect. Not too much. The button hole however is very difficult to manage. Its a little too small. These jeans are cute and comfortable. My first pair and I love them! Very soft and stretchy fabric.